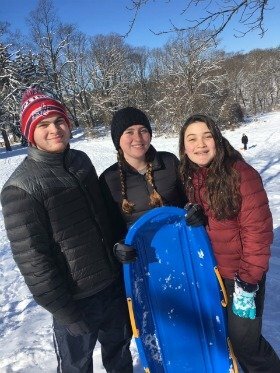 We just enjoyed a rare, quiet weekend with all of us staying warm inside during a pretty significant snow storm Now that my kids are getting older, I am appreciating these days when we are all together. Schools were closed yesterday and we spent time digging out and now it is back to reality! 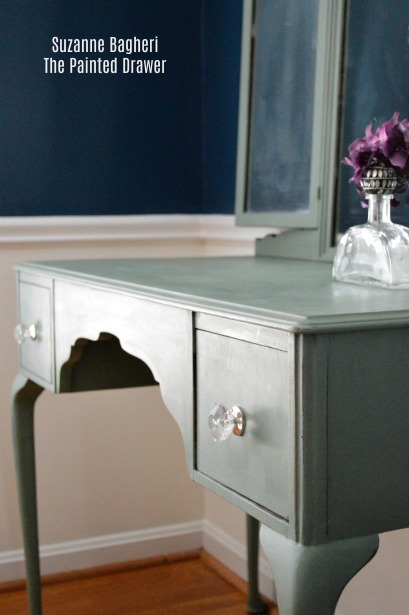 I had time to work on this gorgeous desk for a client of mine, Meg. I have done quite a few pieces for Meg over the years. You can see the Hendredon Tables, Baker Secretary and Farmhouse Red Table in my past posts. Here I’m sharing this really lovely desk and mirror. 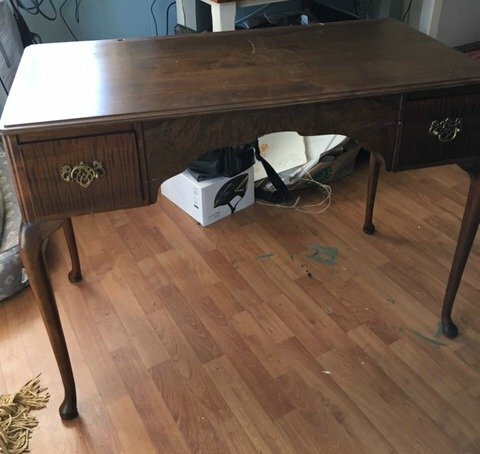 It is quite old, with very pretty lines and working drawers. 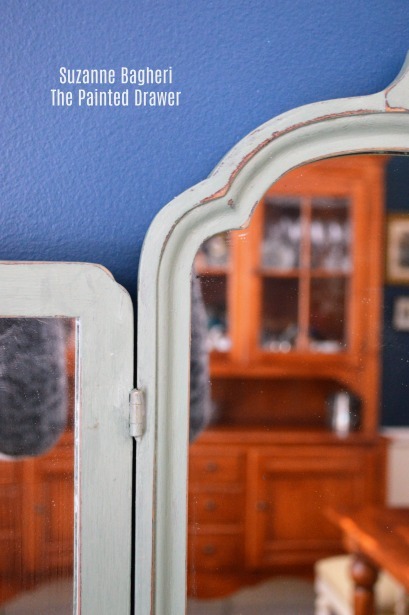 The mirror attaches to the desk and swings forward on either side. 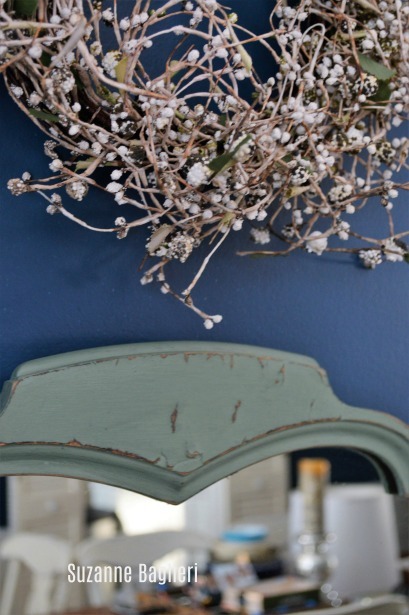 Meg decided on the pretty green color by Magnolia Home, Olive Grove. 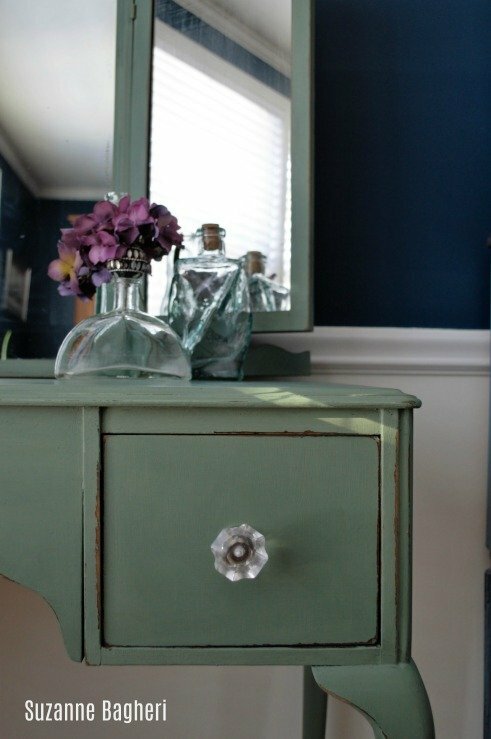 She had seen the Empire Dresser Makeover and knew that it would tie in with the fabric she just purchased for the room. 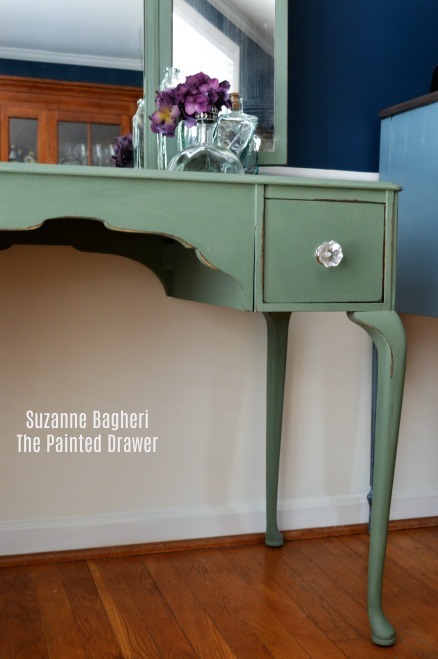 This project took two coats of paint, applied with a Webster brush. It was lightly distressed all over with 150 grit sandpaper and sealed with Annie Sloan Clear Wax. 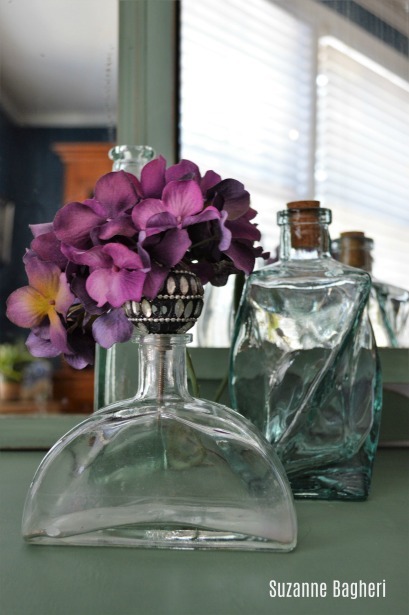 I purchased the new glass knobs at Home Goods. FYI, I purchased the Magnolia Home chalk style paint at my local Target. And yes, I’m a huge fan of Chip and Joanna and love both their style and now their paint line! Hi Kathy! Glad I gave you some inspiration for your piece! Thanks! 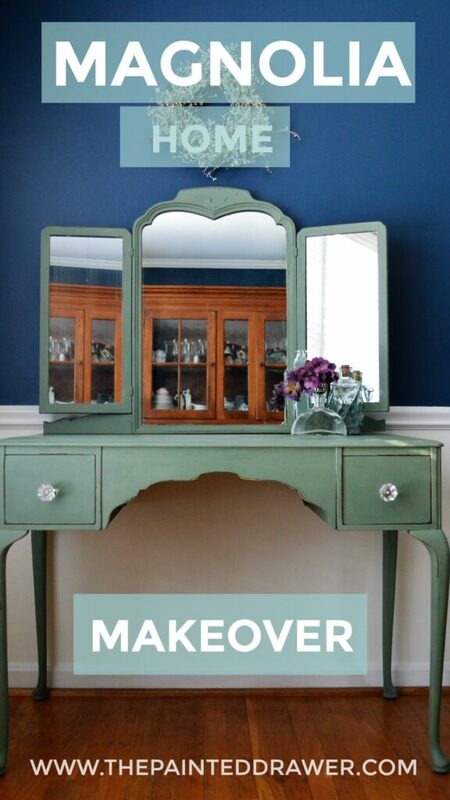 The lines on that desk are so pretty and love that soft green. I will have to try one of Joanna’s colors. Great job as always thank you for sharing. Thanks, Peggy! Definitely try her paint – it’s really nice. So glad you like it! I can’t wait for you to see in person 🙂 So pretty! Yes, it’s beautiful! Just want to say I have written before complaining that I have not had the courage to paint my bedroom set; we finally did it! I wanted to use Magnolia Home Olive Grove too but when we went to buy it our Target was out of stock. That’s the way of it here on the island of Hawaii, so I had to fall back and regroup. 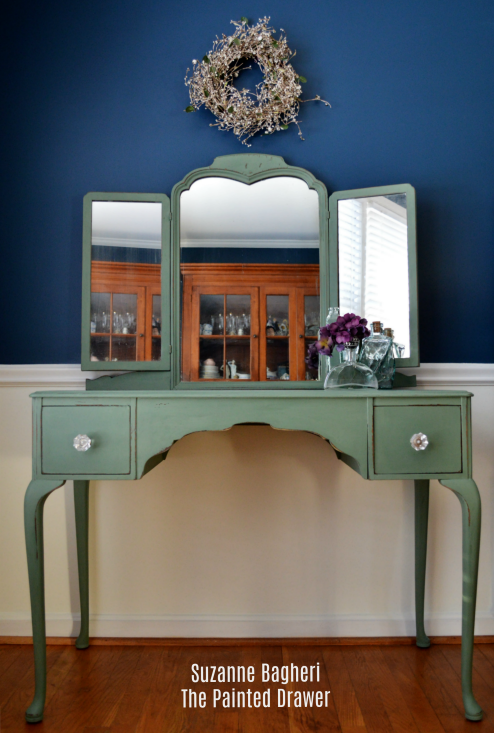 We defaulted to Behr Creme de Mint and it is very pretty: so pretty that after I distressed it I went back and painted over the sanded areas! 😉 I was hoping to be able to post a photo but doesn’t look like I am being allowed. Thanks for all the beautiful furniture you do; it’s very inspiring! P.S. also: thanks for the great tip re: cleaning brass drawer pulls with lemon juice and baking soda. Hi Sharon, I am so glad that your bedroom furniture project turned out so well! Isn’t it amazing what paint can do?! I will have to look for that color because it sounds lovely. So great to hear that my lemon juice/baking soda trick worked! Take care!